This watch is far more than simply a black version of the standard Sinn UX. When Sinn first introduced the U Diver's Series several years ago, the most requested feature was an all Tegimented watch (the standard U models feature a Tegimented bezel). 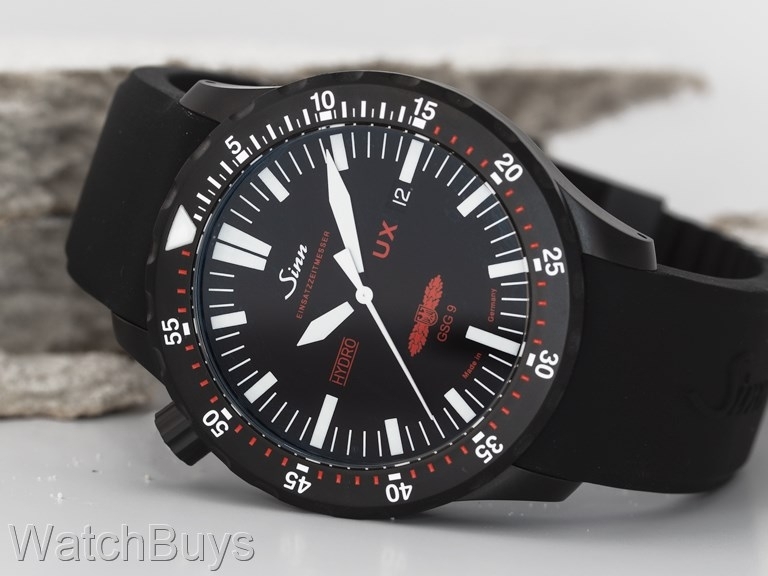 The Sinn UX GSG9 Black is constructed from the same steel that is used on the outer hull of submarines. The steel was procured by Sinn from a steel supplier to Emden GmbH, one of Germany’s North Sea shipbuilding yards who construct submarines from the very same steel. This special steel is also amagnetic which means that is does not have magnetic properties and cannot itself become magnetized. The watch movement itself is protected from magnetic fields up to 4,800 A/m. Next, the Sinn UX GSG9 Black features a completely Tegimented case, bezel, crown and case back. Standard steel used by most watch companies has a hardness of between 200 and 240 HV (Hardness Vickers is a common scale used to measure material hardness). The Tegiment layer on this watch in combination with the PVD coating has a hardness in excess of 2,000 Vickers which is more than nine times harder than standard steel. The Tegiment layer is not a coating consisting of a foreign material, instead the steel itself that has been hardened using a special engineering process that creates a hardened barrier. This process increases the submarine steel's resistance to corrosion, as well as provides extreme protection from scratches and other damage to the case. Unlike the Sinn U1 and Sinn U2, the Sinn UX GSG9 Black features a quartz movement rather than a mechanical movement. By using this type of movement, Sinn is able to fill the watch with oil, which has the double affect of greatly enhancing the readability of the dial and time from any angle (including under water), and increasing the water resistance of the watch even at great depths. The special battery used to power the movement has an expected life of seven years before needing to be replaced. The Sinn UX GSG9 Black is covered with a thick sapphire crystal for extreme protection. This sapphire crystal features a special anti-reflective coating that is scratch resistant - the coating itself has been hardened to 1,800 HV. The uni-directional ratchet operated rotating bezel is also milled from this submarine steel. The indices are machined directly into the bezel without the use of bezel inserts, which can corrode or come loose at deep depths. The bezel features Sinn's Tegiment technology. This watch is designed for operation in extreme temperature variations - it operates in temperatures between -20° Celsius to +60° Celsius. The movement is water resistant to 5,000 meters, and the case is pressure tested to a diving depth of 12,000 meters as certified by Germanischer Lloyd in Hamburg. Matte black dial with date at 3, Super Luminova on hands and markers, and striking red seconds hand complete the design. Other features include sapphire crystal with anti-reflective coating. This watch ships with a U Series style Sinn silicone black rubber strap with your choice of compact or standard buckle. Verified Owner Comments: I have three Sinns and this one will be mine. I like everything about it, especially the quartz movement. It's the most accurate, to ten seconds a year. It is very readable from almost every angle down to 5 degrees from horizontal. Rotating the bezel is very smooth. Please note that because this watch is oil filled using proprietary Sinn technology, all service must be done by Sinn in Frankfurt, Germany. This requirement extends to both service under warranty and after warranty. The battery in this watch has an estimated useful life of seven years after which time the watch must be sent to Sinn for a new battery, flushing of the case, cleaning of the movement, filling with new oil, new seals and pressure testing. There are no watchmakers or service centers anywhere in the world other than at Sinn in Frankfurt who can service Sinn oil-filled quartz watches (EZM 2, UX Series, Hydro Series). Any attempt to service this watch, change the battery or open the case by someone other than Sinn will lead to permanent damage and should not be attempted under any circumstances. Please click here for instructions on sending this watch to Sinn in Germany for service.